Five minutes spent with Jordana will give you insight into your life and a better understanding of the realities and the gifts life has in store. Jordana has an uncanny ability to know in one minute exactly what an individual needs at the moment and sets about creating in that individual a positive sense of themselves. She always says that she loves to leave them laughing, and she does just that. We are all dealt our own deck of cards at birth. We may not be able to change the cards, but we can change the way we play them. A psychic cannot change these cards nor can she take control of another's life. A psychic can shed light on your options and illuminate the path towards your hearts desire. When you make the right decisions you take better charge of your life. A reading with a top psychic like Jordana helps you gain perspective. You will have a clearer understanding about the things you need to modify in order to achieve your goal, whether it be a personal relationship or career move. . A reading with a top psychic is fun and will leave you feeling exhilarated and filled with positive energy. A good tea leaf reader not only knows how to interpret the patterns and symbols that are created by the loose tea leaves in a cup but is able to use her natural clairvoyant abilities. There are several ways to prepare the tea. This depends on the amount of people to be read. Teas leaf reading is a fun experience for a small gathering as well as a large party of people. The patterns in some instances indicate something about to be in a persons life, or can indicate important issues or decisions that are in the person's mind. Sometimes one can see something that happened in the past, but in most instances it involves present situations or those arising in the future. Perhaps a new love. The readings are always fun and uplifting and Jordana's readings are always surprising in their accuracy. Our moods and feelings ...even our health can affect our auras. Readings are fascinating as they can help you have a better understanding of yourself as well as understand hoe feeling and actions can affect our over all well-being. We are all children of fate in some ways as well as children of choice. The percentages are written in our palm at birth. Instantaneously, you will have a better understanding of who you are and why you feel and think the way you do and why you have such a difficult time changing some of these things. Having your palm read is always humorous and can be a ton of fun when having a reading as a couple. Our personalities are etched in our palms. It is great fun to have a psychic read your palm. She will read who you are, how you act, how you react, what you like or dislike by just one swift glance at your palm. Are you compatible with your significant other? Psychics do not usually see an unchangeable, predetermined event. They tend to see the different energies and patterns at work in your life and how and when they are likely to manifest into certain events, that is, if your current momentum remains unchanged. We cannot change certain aspects of our personalities, but we can modify those we deem not working in our best interests. Jordana is magical. A Party Givers Dream ! 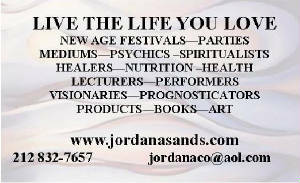 Jordana has taken her psychic abilities and her ability to communicate and coupled that with her ability to entertain. Jordana became interested in dreams during her college years. 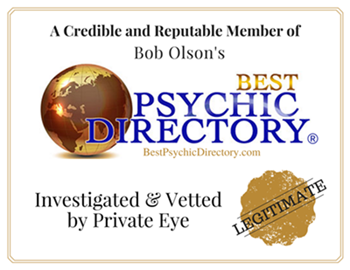 A major in psychology opened the door to parapsychology. As time went on, her interest in parapsychology overtook psychology. Jordana by that time had spent many summers acting in summer stock, went on to study acting at Neighborhood Playhouse. Jordana swears to this day her psychic ability gave her the best insight into the characters she played. We give ourselves away through our handwriting. 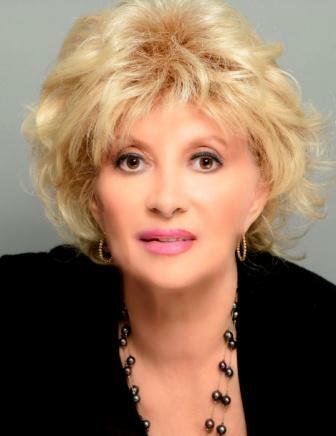 Jordana uses her psychic intuition and combines that with the science of graphology to determine the writer's character traits, personality and emotional make up. To be a good analyst, the psychic needs to have studied graphology. The good psychic graphologist can, with a few carefully chosen words amaze the writer. This is always really fun party entertainment. All go away enlightened and amazed. Jordana is claiarvoyant. The best clairvoyant reading is when you and the psychic both participate. The more concentrated the teamwork, the clearer and quicker the reading. Your focus helps guide the psychic's inner eye to focus on the exact information you need. We commonly think of the intuition as a strong feeling, instinct, or a gut reaction. Intuition is generally a lot more accurate than we generally realize. This little intuitive voice is sometimes like hearing a voice talking far away in the distance. The clairvoyant's ability, to put it simply, is one of refined use of intuition. It is much more active and much more precise. The clairvoyant focuses her intuition without the usual chatter of random thinking. She is totally dedicated to the one receiving the reading. In many instances a clairvoyant will use a crystal ball as a tool for concentration, while others will actually see visions in the crystal. I turn a small party into a full filled evening of improvisation. All participate. One or two of the party are in with me on the theme. And our show begins. My group and I do murder mysteries, and numerous off the wall inprovs can be written to suit the occasion. The improvs are designed to suit the individuals or if a corporation, the corporation's product or service. Numbers enable us to measure our world Numbers are the pulse of all life and of all never ending cycles. The numbers used in numerology are simple and measure and explain the underlying forces Numerology is a precise and accurate way of understanding and improving our lives, minds, feelings, bodies, relationships, and circumstances. Our life is constantly influenced by numbers. Understanding their meanings can bring understanding to the ebb and flow of our lives. Through numerology we can learn to be in control of our lives and that we are always learning that we have so much more to learn. Today more and more people are searching for answers to a better way to live as they search for truth. Years back psychology and holistic medicine were looked upon as way out. Numerology shows us the connection between the cycles of time and how it affects our emotions. Understanding your numerological influences gives you emotional freedom and a much happier life.When you know the number cycle you are in, you will understand the energy that is influencing you and then you will know how to handle it. When you understand how the past brought you to your present, you will understand the importance of making the right decisions today so you will insure a better future. When you can see what things you have been doing wrong, you can take steps to change them in the future You will not repeat the same mistakes over and over again. Our yearly cycles go from 1 to 9 and then back again. I actually takes 9 years to go through all 9 cycles. Each month also brings new numbers and energies into our lives. We can be masters of our own lives. The numbers offer us a wonderful opportunity to use their power to improve our lives. SELECT FIVE RUNES, ONE AT A TIME AND LAY THEM FACE DOWN ONE AT A TIME ON THE RUNE CLOTH. THREE OF THE RUNES ARE THEN PLACED SIDE BY SIDE . ONE IS PLACED ABOVE THE CENTER STONE AND THE FINAL ONE IS PLACED BELOW THE CENTER. STONE. THE RUNE ABOVE THE CENTER (3) INDICATES THE HELP THAT YOU NEED OR MAY RECEIVE TO HELP THE CENTER STONE SITUATION. IF IT IS A NEGATIVE RUNE, IT CAN INDICATE A CLOSEDMIND UNABLE TO ACCEPT THE ADVICE GIVEN BY ANYONE INCLUDINGTHE RUNES IT MAY SHOW SOME SLIGHTPROBLEMS YOU MANY FIND ALONG THE WAY TO SOLVING THE SITUATION. THE RUNE (4) BELOW CENTER STONE INDICATES THE ASPECTS OF THE PROBLEM THAT CAN'T BE CHANGED. POSITIVE RUNES HERE SHOW EASE IN SOLVING THE SITUATION, WHILE NEGATIVE RUNES SHOW OBSTACLES IN YOUR WAY. THE RUNE TO THE RIGHT OF CENTER (5) IS THE RESULT RUNE. THIS RUNE INDICATES THE FINAL OUTCOME, GIVEN THE OTHER FACTORS IN THE RUNECAST.THIS RUNCAST INDICATES THINGS THAT WILL BE COMING UP IN THE NEAR FUTURE UP TO ABOUT THREE MONTHS IN THE FUTURE.